Silicone wristbands, pencils, stickers, bookmarks, buttons, "Drug Free" pledge certificates, lawn signs, banners & weatherproof ribbons and bows. Red Ribbon Week is an opportunity for schools to make a coordinated effort to educate their students regarding drug prevention. 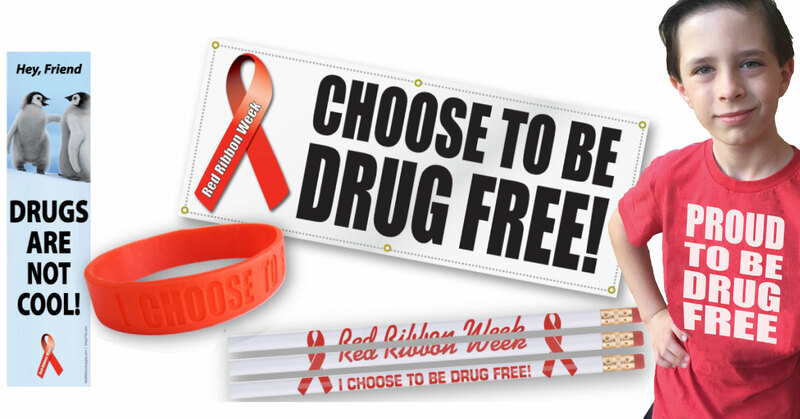 Red Ribbon Week generally takes place the last full week in October, with both weekends included as appropriate celebration dates. Your PTA or PTSA can assist in this effort with posting signs, banners, and posters on campus. You can also give the students drug prevention items to remember the week and make your awareness message more effective. Red Ribbon Week activities continues to be one of the best means to educate youth and encourage drug prevention. ShopPTA.com is a great resource for your PTA or PTSA to find effective and budget friendly drug prevention items. Every year we add something here or there, so please let us know what awarness you would like to see in store for the future.